For more information and contact please visit the KLOPPENBURG LAB. For more information and contact please visit the WIESNER LAB. We aim to understand if and how the different, neuron type specific dependence on mitochondrial Ca2+ handling might contribute to the selective vulnerability of certain neuron types to mitochondrial dysfunction. 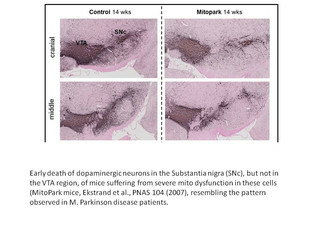 We will a) analyse how mitochondria contribute to controlling free cytosolic Ca2+ in dopaminergic midbrain neurons of the substantia nigra (SN) vs. the ventral tegmental area (VTA) and b) if cell-type specific differences in mitochondrial Ca2+ handling between these two neuron types might contribute to their differential susceptibility to neurodegeneration caused by mitochondrial dysfunction, as seen in ageing and Parkinson’s disease. Lubomirov, L.T., Gagov, H., Schroeter, M.M., Wiesner, R.J., and Franko, A. (2019). Augmented contractility of murine femoral arteries in a streptozotocin diabetes model is related to increased phosphorylation of MYPT1. Physiol Rep. 7(3):e13975. doi: 10.14814/phy2.13975. Paeger, L., Pippow, A., Hess, S., Paehler, M., Klein, A.C., Husch, A., Pouzat, C., Brüning, J.C., Kloppenburg, P. (2017). Energy imbalance alters Ca2+ handling and excitability of POMC neurons. Elife, 6. pii: e25641. doi: 10.7554/eLife.25641. Ortner, N.J., Bock, G., Dougalis, A., Kharitonova, M., Duda, J., Hess, S., Tuluc P., Pomberger, T., Stefanova, N., Pitterl, F., Ciossek, T., Oberacher, H., Draheim, H.J., Kloppenburg, P., Liss, B., Striessnig, J. (2017). Lower affinity of isradipine for L-Type Ca2+ channels during substantia nigra dopamine neuron-like activity: implications for neuroprotection in Parkinson’s disease. J. Neurosci. 37, 6761-6777. Schommers, P., Thurau, A., Bultmann-Mellin, I., Guschlbauer, M., Klatt, A.R., Rozman, J., Klingenspor, M., Hrabe de Angelis, M., Alber, J., Gründemann, D., Sterner-Kock, A., and Wiesner, R.J. (2017). Metformin causes a futile intestinal–hepatic cycle which increases energy expenditure and slows down development of a type 2 diabetes-like state. Mol. Metabolism. 6, 737-747. Neuhaus, J.F.G., Baris, Kittelmann, O. R. A. Becker, K. Rothschild, M.A., and Wiesner, R.J. (2017). Catecholamine metabolism induces mitochondrial DNA deletions and leads to severe adrenal degeneration during aging. Neuroendocrinology 104, 72-84. Lehtonen, J. M., Forsstrom, S., Bottani, E., Viscomi, C., Baris, O. R., Isoniemi, H., Hockerstedt, K., Osterlund, P., Hurme, M., Jylhava, J., Leppa, S., Markkula, R., Helio, T., Mombelli, G., Uusimaa, J., Laaksonen, R., Laaksovirta, H., Auranen, M., Zeviani, M., Smeitink, J., Wiesner, R. J., Nakada, K., Isohanni, P., Suomalainen, A. (2016). FGF21 is a biomarker for mitochondrial translation and mtDNA maintenance disorders. Neurology 87, 2290-2299. Franko, A., Huypens, P., Neschen, S., Irmler, M., Rozman J., Rathkolb, B., Neff, F., Prehn, C., Dubois, G., Baumann, M., Massinger, R., Gradinger, D., Przemeck, G.K., Repp, B., Aichler, M., Feuchtinger, A., Schommers, P., Stöhr, O., Sanchez-Lasheras, C., Adamski, J., Peter, A., Prokisch, H., Beckers, J., Walch, A.K., Fuchs, H., Wolf, E., Schubert, M., Wiesner, R.J., and Hrabě de Angelis (2016). Bezafibrate improves insulin sensitivity and metabolic flexibility in STZ treated diabetic mice. Diabetes 65, 2540-2552.